Ravenswood is een stijlvol comfortabel beach house appartement met prachtig uitzicht op zee op Sandsend Bay, het vegen van Sandsend Nab naar Whitby Abbey. Gelegen in een verhoogde positie op de zee in het charmante dorpje Sandsend. De accommodatie bestaat uit een ruime woonkamer met tv, dvd-speler en een Bose soundbar, comfortabele fauteuils, een bank en een eethoek, allemaal met een prachtig uitzicht op zee. De aparte goed uitgeruste keuken heeft een elektrische oven en kookplaat, Dualit broodrooster en een Nespresso-apparaat. Een slaapkamer heeft een fluwelen bed, met de hand gemaakte matras, donzen dekbed en kussens. Mooie kust decor en gespiegelde wallpaper vervolledigen dit gezellige kamer. De houten panelen badkamer is voorzien van een dubbele eindigde gietijzeren roll top bad, met een traditionele regenval douche. Ideaal om te ontspannen in warme zeep bubbels na een lange dag op het strand. Buiten is er een terras met een zithoek met uitzicht op de zee. Er is een binnenplaats aan de achterzijde. We recently stayed for three days at the beginning of October and loved every minute. The decor of the property was perfect ,very calming and relaxing and it contained everything you could want for a weekend away. The beds were extremely comfortable with big fluffy pillows. The property was warm and there was plenty of hot water for the deep free standing bath and the wonderful shower. The best thing of all was the beautiful view from the window and we spent our time relaxing in the big chairs looking out to sea. I nearly didn't write a review as we would like to keep it to ourselves as it is so lovely. 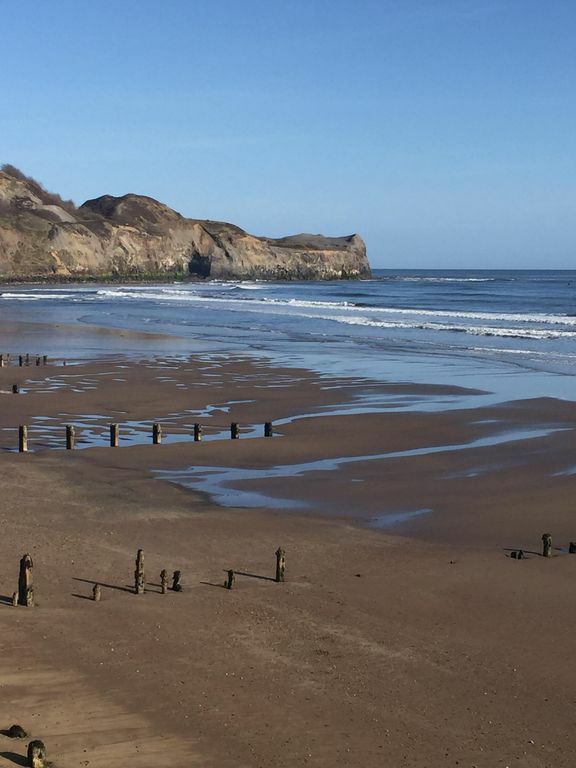 There are a couple of pubs, restaurants and cafes in Sandsend itself and it is near enough to walk to Whitby if you want something more. We also used the local Taxi service who charged around £6.00 one way. There is free parking right outside the property. We will definitely be returning to this property and would recommend it to anyone. Fantastic location and view of the North Sea! We loved the Cottage and all of the terrific local people we met in Sandsend and nearby Whitby! Very relaxing and convenient. What a lovely place sandsend is and the flat is just superb with a lovely view of the beach & sea. Will be definitely coming back. ps: I think the ship in the window needs to go somewhere else so it does`nt spoil that view. Perfect location in comfortable and stylish appartment. Ravenswood is situated overlooking Sandsend beach, minutes from local cafes and restaurants and on a local bus route. Great walking from the door along Cleveland Way. Perfect base for a coastal escape. Excellent location. Well equipped and tastefully decorated. As mentioned above, the location is excellent:a beautiful view over the sea and local pub, cafe, shop make life easy. Accommodation is very comfortable with all sorts of little extras. A bottle of bubbly had been left for us and a pair of binoculars provided for watching ships out at sea. Good for walking with the location being on the Cleveland Way and you can also walk along the beach to Whitby (tide permitting.) The only minor glitches were the lack of a microwave in the kitchen. Obviously a lot of money has been spent getting this property to a high standard and a microwave may come soon, but I would have thought it more of a priority. A bit of a mystery as well. It does not mention Sky tv in the spec but when we had a look about there was a Sky box in the tv cupboard albeit unplugged and in the book of information provided it gave instructions about connecting to Sky. Since there was little desire to watch tv during our stay it was not a problem but it did cause us to scratch our heads for a bit. We also had workmen for a couple of days. A painter was doing the front door ( might have been a good idea to inform us before we came out!) There was also some building work out back. This is advertised as a seating area but we could not use this area. However these are very small things in the overall scheme of things and should not detract from what is a beautiful property in a stunning location with an owner who is keen to give guests an experience to remember. Beautiful apartment in a quiet location, stunning! I stayed here with my Mum for four nights and was amazed how wonderful the view of the beach was from the huge bay windows. Really peaceful and relaxing. Apartment itself was furnished to a very high standard and the designs were lovely. Very clean and well maintained. Location was great, Sansend itself is a lovely little village 10 mins from Whitby and there is a bus stop right opposite with buses running every 30 mins into the town. Whitby itself has a lot to see and do and loads of great places to eat. We loved Magpies cafe! Sansend also had a few good places to eat, try Hart Inn for great pub food. Parking was fine as you can park right outside on the road, but much easier to get a spot after 5pm when all the visitors to the beach have gone home. Alternatively there is a public car park a few hundred yards down the road, but we didn’t need to use it. Lovely place and would highly recommend!